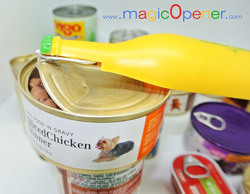 Pet Lovers and Seniors Share Their Love of Extreme Magic Opener! May 17, 2012 – Coral Gables, FL – A thoughtful and practical gift for senior friends or pet lover owners of furry animals large and small proves to be the Extreme Magic Opener. A unique and simple lift tab or tab ring opener simplifying the opening of pet food cans, plastic bottles, glass bottles, soup, or any can that has a lift tab or pull ring. If you are planning to surprise a loved one for any celebration, the Extreme Magic Opener is ideal for disabled consumers focused on purchasing self-help items while maintaining their independence in style. “We have been overjoyed with our last mother’s day gift from our grandchildren. They knew we struggled to open cans with lift tabs or pull rings and bottles with twist off, screw off plastic tops. The Extreme Magic Opener answered our prayers and we love it!” said Maria Arrellano of Miami, Florida. Easy to store and easy to use, every household must have an Extreme Magic Opener. Have it once and have it right, open it with style, with magicOpener. You can purchase and find out more about this must have innovative stylish kitchen magnetic gadget by visiting: www.magicopener.com.